The day I had the biggest of the Intruder range on test was hot to say the least. Over 40° C in fact. In spite of the heat I covered around 200 kilometres aboard the VL 1500. The roads covered were mainly urban commuting stretches with some freeway cruising thrown in for good measure. I do not have a great deal of experience with this style of bike and quite frankly did not expect to find riding the Intruder such a pleasurable experience. No I am not ready to swap my sportsbike for a cruiser – but the ride on the 1500 Intruder through incredible heat was quite good fun. No monos on this test though readers. The big 1,462-cc twin revved very easily. 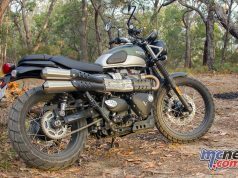 No tachometer is fitted but my impressions were proved correct when we sat the big Intruder on the dyno and gave the 3-valve per cylinder engine full throttle. On the dyno we lined up the Intruder against a slightly modified 1600 Yamaha to gauge the relative engine performance. 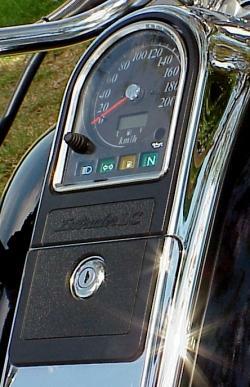 The Yamaha is said and done before 4,500 rpm while the Intruder pulls quite happily to 6,000 rpm. We didn’t hit the rev-limiter but we weren’t really game to push the big twin much further. We had it doing over 200 kph on the dyno with a gear to go. This dyno chart shows how the 1500 Intruder (green trace) wins the horsepower war with Yamaha’s 1600 Cruiser (blue trace). The Suzuki peaks at just under 55 horsepower and the Yamaha just under 50. The Suzuki carries its power much further, but the Yamaha holds the edge until around 3,500 rpm. While this chart shows how the Yamaha (blue trace) wins the bottom end torque competition hands down. 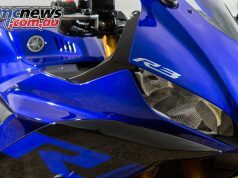 The Yamaha peaked with 115Nm while the Suzuki managed 97Nm. The Yamaha has a much higher torque peak that arrives very early and holds it from around 2,000 to 3,000 rpm. The Suzuki also peaks very early but carries it much further than the Yamaha. The Suzuki likes to rev for such a big twin. Quick launches are easily had. Dial up a healthy amount of revs then dump the clutch. The Intruder then gets off the line very quickly with a dose of wheelspin added for extra amusement. The shifter has a rather long throw, which is a normal characteristic of this style of bike. The 5-speed gearbox is quite good, as is the clutch. Shaft drive negates the need to carry lubricant on long trips. The seating position is very comfortable and the reach to the bars not excessive. Long rides should be a hassle free exercise on the Intruder. A 15-litre tank seems a little on the small side but it is enough for a range of over 200 kilometres. This doesn’t sound a lot, but it is further than the longest stretch without fuel when crossing the Nullarbor. A low-fuel light warns you when to look for a service station. Brakes are excellent (for this style of bike). When given a hard squeeze they can lock the front at lower speeds. Slightly softer compound tyres than standard may prevent this. It is nice to know the brakes have plenty of bite when commuting around on a 296 kilogram (dry) machine. I was surprised at how easy the big Intruder is to change direction etc. It takes less body effort to make changes of direction than many sports-tourers. The Intruder seems to have a very low centre of gravity which is a good thing and is what probably makes the direction changes so easy to complete. However, due to the relatively slow steering you can find yourself running a little wide on tighter corners. 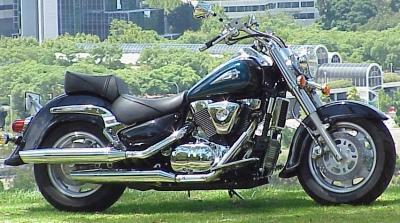 This again is more a characteristic of the cruiser style of bike rather than a direct criticism of the Intruder. I did punt the 1500 around quite hard in places, with boards scraping, throwing it in from corner to corner etc. and found myself having a great deal of fun. The 145mm ground clearance is quite generous in this class of motorcycle. Even though my preferences definitely lean towards the more sporting side of motorcycling I can understand the allure of the cruiser style of motorcycle to many riders. The Intruder is a great looking bike. The tank-mounted instrumentation is quite attractive. A very low 700mm seat height ensures the Intruder is easily boarded by those of us that are a bit short in the leg department. The Intruder we had on test still had the standard pipes fitted which any self-respecting owner would get rid of at the earliest opportunity. 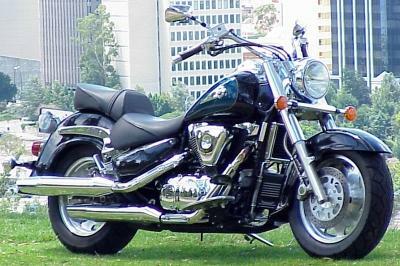 With a nice set of pipes the Intruder may sound better than other bikes in its class as the bike revs much higher. This should endow it with a more exciting note than the ‘potato-potato-potato’ sound of its competitors. Suzuki’s VL 1500 Intruder comes with the peace of mind that a two-year Suzuki warranty brings and can be had for $15,990 + on road costs. 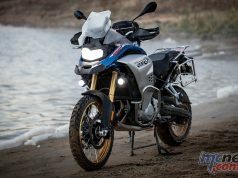 As most owners of this style of bike have a hankering to customize I have included a list of optional Suzuki accessories with approximate prices (AUS). These may be ordered through your local Suzuki dealer.